Isabel of Gloucester, the Lost Queen of England – History… the interesting bits! Isabel of Gloucester is a shadow in the pages of history. I could find no pictures of her. Until recently, no one even seemed certain of her name; in the history books she has been called Isabel, Isabella, Hawise, Avice – probably due to different language interpretations and translations. However, Rich Price, who has done extensive research on primary sources from King John’s reign has clarified that The Close Rolls definitely name her as ‘comitissa Isabella’ and ‘Isabella filia Willielmi comitis’, so we’ll stick with Isabel. Isabel was the youngest daughter, and co-heiress, of William, 2nd Earl of Gloucester and his wife, Hawise, daughter of Robert de Beaumont, 3rd Earl of Leicester; and therefore a great-granddaughter of Isabel de Vermandois. Although her date of birth has been lost to history – most sources say between 1173 and 1176 – she was betrothed in 1176, possibly whilst still in her cradle, to Prince John. The youngest son of Henry II and Eleanor of Aquitaine, John was 9 years old at the time of the betrothal. However the wedding did not take place until 1189, when John was 21. 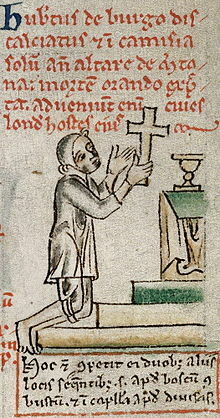 Baldwin, the Archbishop of Canterbury at the time, opposed the marriage as the couple were related within the prohibited degrees, both being a great-grandchild of Henry I, and ordered that they should not live together as husband and wife. John promised to seek a papal dispensation, in order to overcome Baldwin’s objections – although it appears this was never obtained. Nonetheless, John and Isabel were married on 29th August, 1189, at Marlborough Castle, Wiltshire. Although they were married for 10 years, it is possible they never, or rarely lived together. They never had any children and it is during this time in his life that John’s illegitimate children were born. John succeeded to the throne on the death of his older brother Richard I – the Lionheart – on 6th April 1199. He was crowned king on 27th May 1199; the fact that Isabel was not crowned alongside him, suggests that John was already looking for a way out of the marriage. Isabel would never be styled Queen of England. Within months of his succession, possibly as early as 30th August 1199, but certainly by 1200, John had obtained a divorce on the grounds of consanguinity; the bishops of Lisieu, Bayeux and Avranches, sitting in Normandy, provided the required judgement. However, in order to keep his hold on the substantial Gloucester lands, John detained Isabel in ‘honourable confinement’ for the next 14 years. He eventually arranged a new marriage for her, to a man who was over 16 years her junior. In 1214, although probably past child-bearing age – certainly safe child-bearing age – she was married to Geoffrey de Mandeville, Earl of Essex, who had paid the considerable sum of 20,000 marks to become her second husband and Earl of Gloucester ‘jure uxoris’ (by right of his wife). Just 2 years later, in 1216, de Mandeville died from wounds he’d received in a tournament in London. One of the Magna Cart sureties, de Mandeville was in a state of rebellion, against the crown, when he died; as a result, all his lands and titles – including the earldom of Gloucester – were forfeit to the crown. It was not until 17th September 1217, almost a year after the death of King John, that Isabel’s lands were returned to her. At about the same time – or shortly after – Isabel was married for a third and final time, to Hubert de Burgh. Hubert De Burgh had become Chief Justiciar of England in 1215 and would rise to be Regent during the minority of Henry III. It was only several years after Isabel’s death that he would be created Earl of Kent. This final marriage was, sadly, very short-lived and Isabel was dead within months – possibly only a few weeks – of her wedding day and almost exactly a year after the death of her first husband, King John. In spite of 3 marriages, Isabel never had children and was succeeded to the Earldom of Gloucester by her nephew, Gilbert de Clare. She was laid to rest in Canterbury Cathedral, Kent. Further Reading: Robert Bartlett England Under the Norman and Angevin Kings 1075-1225; Dan Jones The Plantagenets; the Kings who Made England; The Plantagenet Chronicle Edited by Elizabeth Hallam; Maurice Ashley The Life and Times of King John; Roy Strong The Story of Britain; Oxford Companion to British History; Mike Ashley British Kings & Queens; David Williamson Brewer’s British Royalty; Rich Price King John’s Letters Facebook page. Thank you so much, Anne Marie. on the net. I’m going to recomkend this web site! Pingback: Ela: Heiress, Wife and Abbess – History… the interesting bits! This was posted on my King John’s Letters Facebook page today, thank you very interesting! The Close Rolls, however, definitely name her as ‘comitissa Isabella’ and ‘Isabella filia Willielmi comitis’, so Isabelle/Isabella seems to be clearly attested as her official name. Thanks Rich, that’s good to know. I have seen so many different names in the history books. I’ll edit that info into the post. Best wishes, Sharon. I always feel Isabella had some peculiarities in her character which even king john can’t intimidate , She never questioned the divorce and everything else can be interpreted this way , may be she was someone always gave john a feeling of unreachable or some kind of a strong personality . To be honest, I don’t think we know enough about Isabel to get a really good impression of how she felt. John kept her a virtual prisoner for years after the divorce. She may have been happy to no longer be married to John – it certainly wasn’t a love match – but I doubt she was happy to be denied her access to her lands and property.